Sam Snead is one of the giants of golf, a golfer who remained competitive at the highest levels well into his 60s and died as the all-time leader in PGA Tour wins. Sam Snead: "Keep close count of your nickels and dimes, stay away from whiskey, and never concede a putt." Sam Snead: "If a lot of people gripped a knife and fork the way they do a golf club, they'd starve to death." Sam Snead: "Thinking instead of acting is the number-one golf disease." Sam Snead: "Practice puts brains in your muscles." 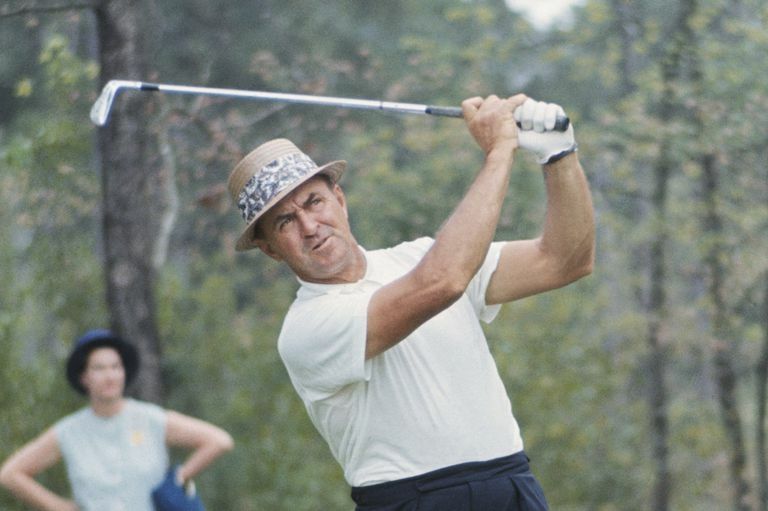 Tim Finchem: "No one will ever duplicate Sam Snead. No one will ever surpass Sam Snead because he was so unique." Snead's eighth win at the Greater Greensboro Open happened when he was 52 years old, making him the oldest winner in PGA Tour history. Snead won 27 times on tour before getting his first major championship title. From 1984 to 2002, Snead hit the honorary opening tee shot at The Masters. He was joined by Byron Nelson until 2001 and by Gene Sarazen until 1999. On May 16, 1959, Snead carded a round of 59 in the Greenbrier Open, a regional pro-am played at The Greenbrier resort in West Virginia. This is generally recognized as the first 59 recorded during tournament play, although it wasn't a PGA Tour event. Snead appeared in several "acting" roles (playing himself), including in the motion picture The Caddy, a Jerry Lewis movie released in 1953; and a 1957 episode of The Phil Silvers Show. Sam Snead won 82 PGA Tour events, more than anyone else, and he did it with a remarkably fluid and graceful swing. "The most fluid motion ever to grace a golf course," Jack Nicklaus said. "Watching Sam Snead practice hitting balls," another golfer said, "is like watching a fish practice swimming." Snead grew up in backwoods Virginia during the Depression and taught himself to play golf using clubs carved from tree limbs by his father. He never lost sight of his home, returning to Virginia throughout his life. Snead was an extremely gifted athlete, so gifted that even into his 70s he could still kick the top of a door frame. And although he could rub his fellow pros the wrong way sometimes - Snead could be rude, crude and difficult to deal with - for the public he had a folksy image embellished by his trademark straw hat and homespun wit. Snead burst onto the PGA Tour in 1937, wowing with long drives that earned him the nickname "Slammin' Sam," and winning five times. The following year he won eight tournaments and the money title. In 1942, he won his first major at the PGA Championship. He would go on to win the PGA three times total, one British Open, and three Masters (including a memorable 18-hole playoff victory over Ben Hogan in 1954). In 1950, Snead won 11 times, the last PGA Tour golfer to post double-digit victories in a single season. While Snead won seven majors, he never could win the U.S. Open, although he finished second four times. In 1939, needing par to win, he scored 8 on the 72nd hole. In 1949, Snead missed a 2 1/2-foot putt on the final playoff hole to lose to Lew Worsham. His record in eight Ryder Cups was a sterling 10-2-1, and he captained three Ryder Cup teams. Snead was one of the best "old" golfers ever, remaining competitive into his 60s. At age 62 he finished third in the 1974 PGA Championship; at age 67, he posted rounds of 67 and 66 at the Quad Cities Open. He also won six Senior PGA Championship titles and five World Seniors Championships. In 1983, at age 71, he shot 60 at his home course, The Homestead. Sam Snead was elected to the World Golf Hall of Fame in 1974. His newphew, J.C. Snead, was also a winner on the PGA Tour. 1936: West Virginia Closed Pro. 1937: Oakland Open, Bing Crosby Pro-Am, St. Paul Open, Nassau Open, Miami Open. 1938: Bing Crosby Pro-Am, Greater Greensboro Open, Inverness Invitational, Palm Beach Round Robin, Chicago Open, Canadian Open, Westchester 108 Hole Open, White Sulphur Springs Open. 1939: St. Petersburg Open, Miami-Biltmore Four-Ball, Miami Open. 1940: Inverness Invitational Four-Ball, Canadian Open, Anthracite Open. 1941: Bing Crosby Pro-Am, St. Petersburg Open, North and South Open, Canadian Open, Rochester Times Union Open, Henry Hurst Invitational. 1942: St. Petersburg Open, PGA Championship. 1944: Portland Open, Richmond Open. 1945: Los Angeles Open, Gulfport Open, Pensacola Open Invitational, Jacksonville Open, Dallas Open, Tulsa Open. 1946: Virginia Open, Jacksonville Open, Greater Greensboro Open, The Open Championship, World Championship of Golf, Miami Open. 1949: Greater Greensboro Open, Masters Tournament, PGA Championship, Washington Star Open, Dapper Dan Open, Western Open. 1950: Los Angeles Open, Bing Crosby Pro-Am, Texas Open, Miami Beach Open, Greater Greensboro Open, Western Open, Colonial National Invitation, Inverness Four-Ball Invitational, Reading Open, North and South Open, Miami Open. 1951: PGA Championship, Miami Open. 1952: Masters Tournament, Palm Beach Round Robin, Inverness Round Robin Invitational, All American Open, Eastern Open. 1954: Masters Tournament, Palm Beach Round Robin. 1955: Greater Greensboro Open, Palm Beach Round Robin, Insurance City Open, Miami Open. 1957: Palm Beach Round Robin, Dallas Open Invitational. 1960: De Soto Open Invitational, Greater Greensboro Open. Snead had many other wins in unofficial (non-PGA Tour) events, including 16 wins in the West Virginia Open, plus the Brazil Open and Panama Open. As a senior (over-50) golfer in the days before the existence of the Champions Tour, Snead won what is now called the Senior PGA Championship six times, in 1964, 1965, 1967, 1970, 1972 and 1973.